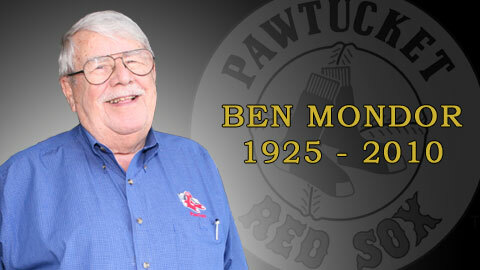 Ben Mondor passed away peacefully Sunday evening at his home in Warwick Neck, RI at the age of 85. He is survived by his wife Madeleine. The public is invited to a celebration Mass to be held on Thursday, October 7 at 10:00 am at the Cathedral of Saints Peter & Paul on 30 Fenner St. in downtown Providence. Burial services will be private. In lieu of flowers, the Pawtucket Red Sox have requested that friends honor Ben Mondor's memory through the Pawtucket Red Sox Charitable Trust. "We have lost a true Rhode Island treasure and the entire PawSox Family mourns this great loss," said PawSox president Mike Tamburro. "Ben was a man who brought people together - whether it be at the business table or the ballpark. His love for the fans and the community was unsurpassed." At the time of his passing, Mr. Mondor had just completed his 34th year as PawSox owner. In 1977, after having retired from the corporate business world, Ben acquired the "Rhode Island" Red Sox, the Triple-A International League affiliate of the Boston Red Sox, by the National Association of Professional Baseball. The organization was bankrupt and had been deprived of its membership in professional baseball. During the next 34 years, Mr. Mondor turned what was once one of the worst franchises in minor league baseball into one of the most successful in all of baseball as over 14 and a half million fans attended a game at McCoy Stadium while Ben owned the club. Under Mr. Mondor's leadership the PawSox went from drawing 70,000 fans in 1977 to well over 600,000 fans in six straight seasons from 2004-2009 (an attendance increase of nearly ten times since that first year). The PawSox established their all-time franchise attendance record of 688,421 fans in 2005. Ben's historic career was captured for eternity on July 20, 2008 when he was officially inducted in the International League Hall of Fame as part of the first class welcomed to the IL Hall of Fame since 1964. One of the greatest seasons in PawSox history occurred in 2004 when the PawSox, under the direction of Mondor, hosted an extremely successful three-day festival centered around the 2004 Triple-A All-Star Game played at McCoy Stadium in July. That memorable year was capped on the night of November 10, 2004 when Ben Mondor was inducted into the Boston Red Sox Hall-of-Fame at the 5th Boston Red Sox Hall of Fame Dinner and Enshrinement Ceremony. The honor was extra special because Ben was joined by former PawSox and Boston greats 3B Wade Boggs and LHP Bruce Hurst, as well as National Baseball Hall of Fame pitcher Dennis Eckersley (himself another former Pawtucket player) who were all voted in by the club's Hall of Fame selection committee. According to the Red Sox Hall of Fame selection committee, "Ben Mondor rescued Triple-A baseball in Pawtucket and over the last 28 years has turned the PawSox into one of the most beloved franchises in Minor League Baseball. Along the way, he has contributed to the development of countless Red Sox prospects on the road to Fenway Park." In August of 2003 the PawSox welcomed their 10,000,000th Fan to McCoy Stadium during Ben's tenure. That milestone was celebrated in style on August 9, 2003 when the Sheehan Family of Lincoln, RI was presented with a new car, a lifetime pass to McCoy, along with other prizes. To put that moment into perspective, if the PawSox had continued at their 1977 attendance pace it would have taken over 142 years to draw 10 million fans to McCoy. Instead, that milestone was reached in 2003. Following a record-breaking 1999 season at the newly-renovated and expanded McCoy Stadium, when the PawSox finished 3rd in the nation in attendance, that achievement was put into perspective when Mondor received some of the top honors in the industry. That December, Ben received the "Sporting News Executive of the Year Award" and then in January the "Judge Emil Fuchs Award" for long and meritorious service to baseball from the Boston Baseball Writers. Furthermore, at the conclusion of the 1999 season Mondor was unanimously selected as the International League Executive of the Year in voting conducted by the IL Board of Directors. Ben received many other prominent awards. His efforts were recognized with several top honors including the distinguished "John H. Johnson President's Trophy" in 1990 as presented by the National Association of Professional Baseball Leagues. As just the 17th winner in history, Mondor accepted the award given to the club that exemplifies the standards of the complete baseball franchise. The PawSox were also selected by Baseball America as the top Triple-A operation - receiving the 1990 "Bob Freitas Award". The PawSox became just the fourth organization in all of Minor League Baseball to earn a second Freitas Award when Baseball America chose the PawSox for their 2003 Bob Freitas Award. His success did not come overnight, however. In his first year as owner of the PawSox, Ben had the dubious distinction of drawing just 70,000 fans for a pennant-winning ballclub in 1977. That figure is believed to be the lowest attendance for a championship ballclub in the 127-year history of the International League. From 1987-1995 the Pawtucket Red Sox established nine consecutive regular season attendance records. In addition, throughout the decade of the '90's, the PawSox consistently ranked among the Top Ten teams in the country in yearly attendance (out of approximately 180 clubs). An incredible feat considering the fact that Pawtucket is the smallest city and McCoy was the smallest stadium in all of Triple-A baseball. That changed prior to the 1999 season, however, as McCoy Stadium underwent an ambitious $16 million renovation and expansion project. With McCoy in dire need of repair to meet PBA (Professional Baseball Association) and ADA (Americans with Disabilities Act) requirements, the future of the PawSox was in doubt. Despite several flattering offers from cities that craved for professional baseball, Ben had clearly stated his intention all along - he wanted the PawSox to remain in the city of Pawtucket. It was then that Mondor stepped to the plate and insured the future of the ballclub by his willingness to personally accept major renovation costs. As a result, Pawtucket's venerable ballpark would get a new lease on life. The New McCoy Stadium - The Building of Dreams - would indeed become a reality. Highlights of the renovation project, which began during the 1998 season and was completed prior to the 1999 season, included increased seating, new grandstand with entry tower, new playing field, expanded main concourse with additional restrooms and concession stands, new video board and scoreboards, and a host of other ADA and structural improvements in and around McCoy Stadium. The New McCoy has played to rave reviews ever since. Although the playing field changed during the renovation, McCoy Stadium will forever be known as the breeding ground for several of the greats of the game over the last three decades. Throughout the course of the '97 season, fans had the chance to select the PawSox All-Time 25th Anniversary Team. Over 30,000 votes were cast and some of the best names in baseball were chosen as stars like Jim Rice, Roger Clemens, Wade Boggs, Mo Vaughn, and Nomar Garciaparra - all Mondor favorites - were honored. In more recent times, current Red Sox stars like Jonathan Papelbon, Kevin Youkilis, Dustin Pedroia, Jon Lester, Clay Buchholz, and Daniel Bard all played for the PawSox under Mondor's watchful eye. One of Ben's highlights in the early years of his PawSox ownership came in 1981 when McCoy Stadium hosted the "Longest Game". The 33-inning affair (32 innings played on April 18-19 of 1981 and the 33rd and final inning on June 23 of 1981) captured the nation's attention as the PawSox beat the Rochester Red Wings, 3-2 in what to this day is still the longest game in the history of professional baseball. As patriarch of Rhode Island's oldest and most successful professional sports organization, Mr. Mondor was known as a "fan's owner". He effectively created a warm, friendly, and clean baseball atmosphere with both affordable ticket and concession prices for the entire family. Mr. Mondor was a proud member of several Boards of Directors and Trustees and was involved in a large number of the top charitable organizations throughout the state of Rhode Island (too many to mention here). He created the Pawtucket Red Sox Charitable Foundation to help support numerous charitable groups throughout New England. Perhaps most importantly, however, Ben's loyal commitment to PawSox fans everywhere will forever be his legacy as Pawtucket Red Sox Baseball has indeed risen to become a New England institution.